I have ordered a rebuilt fuel pump (I believe Mark has also). 375.00 rebuilt to handle modern crappy gas. I will report back on how things work out. I received my fuel pump yesterday August 4 . There was a $42. Postage charge and $62 . Customs Tax also . Well worth the costs to have a pump . Thanks John Phillips for the contact information . If I was not on this site I would never know which model I required . Fuel pump came in very quickly as I just sent the check Monday morning. Here it is. Hopefully it is the right one! Just a note, I contacted Art a few weeks ago to rebuild my pump, and the price is now 600 to rebuild, not replace. 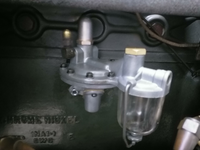 As I thought that price was excruciating to my wallet, my uncle helped me find Then and Now Automotive in Weymouth Mass who makes a current kit for the Royale pump as well as rebuilds our pumps with his kit. The kit is 45 dollars to do it yourself, or 95 to rebuild. Quality seems to be excellent, and will report back when it's running. Wow. what a difference in price. Do you have contact information for Then and Now Automotive, I am going to give them a try. I never had any problem with Gould's rebuild but I thought it was pricey at $375, much less $600! The contact info is 781-335-8860 and the fellas name is Ted whom I spoke with, but the family is quite knowledgeable. 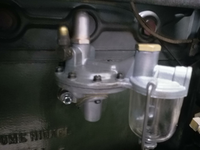 The pump came back as you would expect fully rebuilt, brass pieces polished and the body of the pump sealed in a grey protective coating that resists gas and oil. Ted guarantees his kit to resist all the new additives in the gas. They also do much much more. Turn around time was fantastic as I shipped it overnight on a thursday and had it installed back on the car the following Wednesday. I just sent him a spare 301 schebler for rebuild,so I'm keeping my fingers crossed.